Gotham: A city shrouded in darkness, crowded with the most notorious criminals in history and protected by a tortured anti-hero. In other words, the perfect location inspiration for a fun, family-friendly theme park. Right? Right, according to Warner Bros., who are building a fully-immersive Gotham City in their upcoming theme park Warner Bros. World. 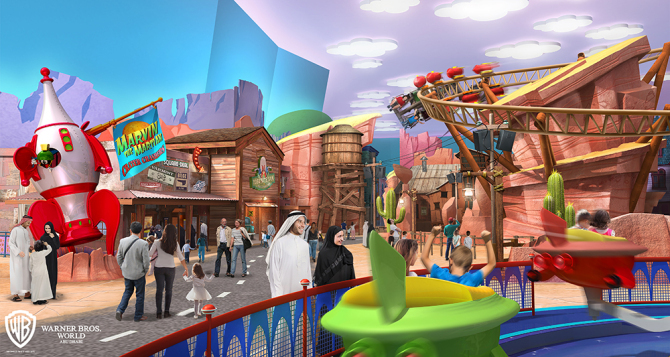 The park is currently being built in Abu Dhabi and is apparently halfway to completion, so Warner Bros. have offered us all the first glimpse at the concept art – and it’s the stuff of your dreams – or, possibly, nightmares. Visitors are welcomed to roam the streets, a la batman and the Joker, as well as his other nefarious foes. The fully immersive experience allows you to choose to fight for fictional good or evil, unless you’re pretending to be the ambiguous rogue Harvey Dent, in which case you can sit on the fence. The $1 billion dollar theme park – which is presumably backed by the only man who could afford such lavish expense, Bruce Wayne – will features restaurants, live action events, rides and plenty of dark alleyways in which to swish your cape. The indoor facility – presumably to protect visitors from the arid heat and enable them to keep cool in the cosplay – will also include Superman’s city of Metropolis. 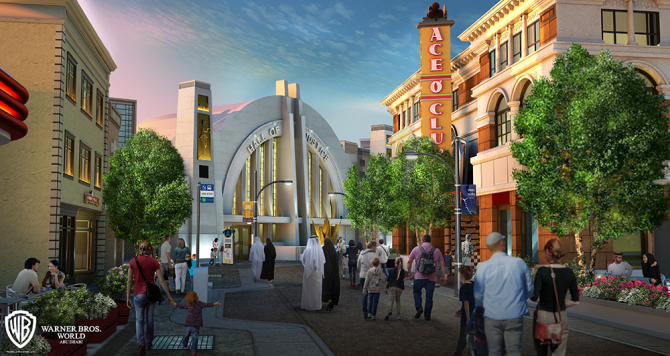 Warner Bros. World Abu Dhabi will be a state-of-the-art themed experience that authentically brings some of the studio’s most iconic characters and stories to life under one roof for the first time in the Middle East. We have been closely collaborating with our partners at Miral to faithfully construct immersive worlds that resonate with precise details and are thrilled to share these unique experiences with fans next year. Warner Bros. World is on course to open in 2018, and frankly it can’t come soon enough. People deserve to have their faith rewarded. Start practising your Bane impression immediately.